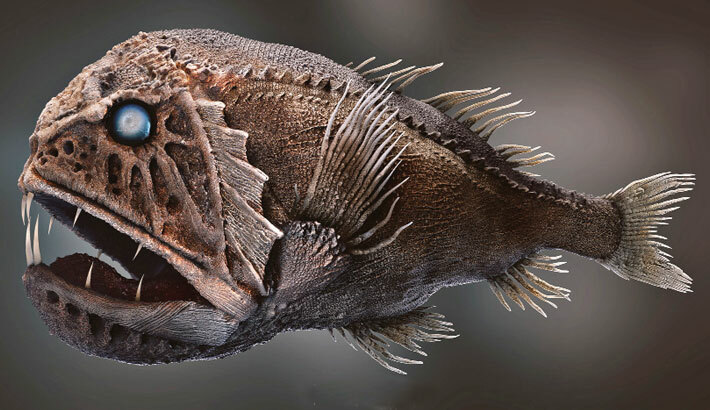 The Fangtooth is a horrorful looking deep sea creature with teeth as long and scary like that of a vampire in a movie, obviously that's where it got its name, fangtooth. it belongs to the family of Anoplogastridae, with a circumglobal distribution in tropical and cold-temperate waters. While understandably named for their disproportionately large, fang-like teeth and unapproachable visage, fangtooths are actually quite small and harmless to humans: the larger of the two species, the common fangtooth, reaches a maximum length of just 16 cm (6.3 in); the shorthorn fangtooth is less than half this size though currently known only from juvenile specimens. The head is small with a large jaw and appears haggard, riddled with mucous cavities delineated by serrated edges and covered by a thin skin. The eyes are relatively small, set high on the head; the entire head is a dark brown to black and is strongly compressed laterally, deep anteriorly and progressively more slender towards the tail. The fins are small, simple, and spineless; the scales are embedded in the skin and take the form of thin plates. As compensation for reduced eyes, the lateral line is well-developed and appears as an open groove along the flanks. 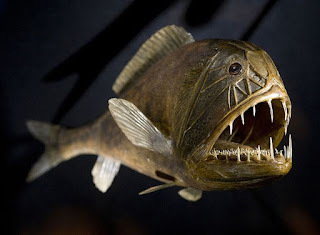 The Fangtooth, like most ocean monsters, lives in the deep water and are unable to survive at shallow depths. They are found as deep as 5 kilometres/3.5 miles deep. At this depth, there is no light. Any light found is generated from other fish. The water in their habitat is between 36°F to 32°F/ 2°C to 0°C. The Fangtooth uses contact chemoreception to locate its prey. Contact chemoreception is a means in which a fish is able to detect chemical signatures in the water. Chemical signatures of other fish. This, along with radar, is the only option for locating food in the deep ocean where it is sparse. Most of the time, Fangtooth are found between 600 to 6,500 feet/200 to 2,000 meters down. Even at these depths, light is not visible and the world is dark and cold. Fangtooths have planktonic larvae and are assumed to not be egg guarders; spawning frequency and time are not certain, but some activity has been reported from June–August. The juveniles of common fangtooths begin to assume adult form from about 8 cm (3.1 in) in length, at which time they begin to descend into deeper water. Onset of maturity is not known, but common fangtooths are known to be mature at 16 cm (6.3 in). They are probably slow-growing, as are most deep-sea fish.